This week we decided to do a theme in a sense. We’ll be doing recent replays for not only Uno! by Green Day, but also Dos! and Tre! later on in the week. I’m not going to talk too much about it in here, because I want to be able to get right into the review for you guys. The first track up is Nuclear Family. It opens with a hard beat and some heavy drumming that jumps out at me. The vocals seem to blend into the background a bit, but it works well allowing it to blend in with the guitar and drum. The focus shifted between the three through the song, allowing it to move at a fast pace that would get your blood pumping. Track two on the album is Stay the Night and it opened a bit slower that Nuclear Family, with the opening focus more on melody and guitar. It picked up rather quickly after a moment, blending in drums before the vocals took over as the focus for the song. Overall it kept the same melodic essence it opened with. In general it’s a very pretty song and I love listening to it now and again. Track three is Carpe Diem and picked back up the focus on the beat of the song. It was a harder opening than Stay The Night, and the focus quickly changed to the vocals. overall the song was a very beat driven song with a fair amount of energy and a strong guitar presence where the vocals drop away. The fourth song on the album is Let Yourself Go and it opens fast and hard. The guitar and drums set the speed and the vocals come in, building the intense energy that the song contains. It’s the perfect follow up to Carpe Diem, which builds the energy in a way that hearing Let Yourself Go will just automatically release it. The fifth song on the album is Kill The DJ, and it starts off as slower with a more electronic and groovy vibe. The vocals hit a few more high notes than in the previous four songs. It’s a fun song to listen to, but it’s not a favorite for me by a long shot. It’s followed by Fell For You, which makes a return to heavy beat and fast guitars as it opens, but the vocals bring the speed into check introducing a soft melody to the song. The two blend together well as the song continues. The seventh song on the album is Loss of Control and it has a darker, drum driven opening that is revved up suddenly into a high energy song. The vocals take the lead, as they do in a lot of songs, but they also blend into the other instruments on this track, creating a very gorgeous effect during the bridge and chorus. This song is directly followed by the song Troublemaker which is a vocal and guitar driven opening, with a bit more strength to the guitar. It’s a decently paced song, neither too fast or two slow. It’s a great song to listen to and it’s one that I often tune into. Angel Blue is the ninth song on the album, and it returns to a fast guitar driven opening that drops off for the vocals, but it maintains it’s really quick speed through the whole of the song, creating a energy pumping song that really helps you to get up and moving more often than not. It’s followed by the track Sweet 16 which returns to a slower speed and a more melody driven song. Sweet 16 is a very pretty song that blends a focus on the guitar, drums, and vocals as it plays. It’s one of my favorites off of this album. Track eleven is Rusty James and it is a guitar and drum driven opening that maintains a decent speed that’s not too fast, or too slow. It’s a song that builds energy right up to the point where it starts to release it during the chorus. It’s no where near as energetic as several other songs on the album, but it’s a great lead into the last track on the album, Oh Love. The twelfth track focuses on guitar during the initial opening, with the vocals coming in and stealing the focus off of the guitar rather quickly. It’s a melody driven song that’s quiet, but explodes into the loud noise that is almost an integral part of the album. So, wrapping up so this joint review isn’t too long, Uno! is a great album in my opinion, but it’s hardly my favorite out of it’s era or my favorite Green Day album at all. I do love listening to it though, because it’s got something new every time I do. The first in the trilogy is a huge departure from the previous two albums,American Idiot and 21st Century Break Down. Fans that became fans of Green Day because of those albums (like myself) might be shocked, but not if they’ve taken the time to listen to older albums that don’t tell some story in their lyrics. Actually, of the three new albums released not too long ago, I dare say that this is my favorite of the three. Immediately you just lose yourself in this high-energy song, “Nuclear Family”, that’s totally relatable to a whole new generation. That song flows into other high energy, but mood altering songs that you can completely lose yourself in. And that’s the whole album – an album where you can forget everything else while it’s playing; simultaneously a retrieve and reflection of the society we live in today. It’s that feeling of rocking and pouring your heart out as you sing/scream along to lyrics that run on pure emotion that makes this album so great. It’s a much welcome return to those songs that mean no more than what you make of them, while saying everything at once. 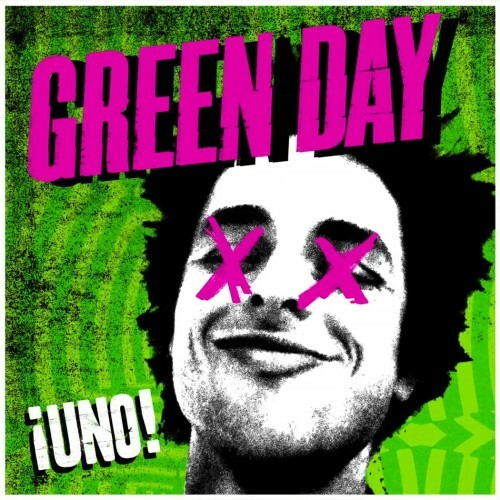 While the brilliancy of Green Day’s previous two albums was outstanding, Uno! is a nice return to the type of songs and music that made them famous in the first place. Except so, so much better because you can still tell how much they’ve grown as people and as a band in all of the years that they’ve been together. Amidst the loud rock n roll songs that you can scream along to while you dance around your room like an idiot (“Let Yourself Go”, “Kill The DJ”, and others) there’s also calmer, sweeter songs that make you want to go out and find a person and cuddle up with them (“Stay the Night”, “Sweet 16”, and others). And the style and tone is so much different from what they started out with in albums likeDookie while still keeping those classic elements that made them. Again, it’s what makes you really think about just how long they’ve been together and what they’ve done, and how they’ve changed. There’s a nice flow, and you still lose yourself in the music as you feel the album winding down. I could go on and on about how amazing it is. End line: It’s got everything you could want in a punk rock album; songs that you lose yourself in, clever lyrics, great vocals, lots of guitars and drums, and that absolute feeling of wanting more. That’s probably the reason that there are of course two more after it. Posted on July 15, 2014 November 2, 2014 by musicunlabeledPosted in UncategorizedTagged album review, green day, joint review, recent replay, review, uno!, uno! dos! tre!.